Citrix officially launched XenDesktop 7 at Citrix Synergy 2013 this week in Los Angeles. We're at the conference to demonstrate how the ExtraHop platform equips IT organizations with the correlated, cross-tier visibility that they need to manage ever-growing XenDesktop deployments. In addition to real-time end-user experience insights, ExtraHop enables Citrix administrators to see into the back-end infrastructure performance, which can affect login times, reconnects, and client latency. Using ExtraHop, Citrix teams can verify that XenDesktop is performing well and also see the real cause of poor application performance wherever it resides in the underlying environment. The Citrix server-based computing community has been anticipating XenDesktop 7 since it was first announced one year ago. XenDesktop 7 will help IT organizations bring Windows desktops and applications into the era of mobility and cloud services. Enhancements for mobile users – New HDX deep compression and redirection technologies will improve experiences for users with consumer devices that are connecting over mobile broadband networks. The redesigned Citrix StoreFront will also make it easier for users to seamlessly access desktops and applications. Simpler administration – XenDesktop 7 will also incorporate the capabilities previously available within XenApp, enabling IT organizations to unify management and administration of hosted applications and desktops (XenApp) and personalized desktops (XenDesktop). A boon to sysadmins working with the latest Microsoft technology, XenDesktop 7 will also feature optimizations for Windows 8 and Windows Server 2012. Citrix's vision for XenDesktop 7 is to enable IT organizations to provision virtualized desktops and applications as easily as a cloud-computing provider, even for users with mobile consumer devices. It's an exciting proposition and one that fits perfectly with ExtraHop's vision of dynamic and comprehensive performance monitoring. With ExtraHop's powerful Citrix ICA analysis capabilities and our ability to correlate Citrix streams and channels with activity at all of the back-end tiers, Citrix administrators and IT Operations teams can tie specific front-end issues to back-end infrastructure performance, including network, authentication service, middleware, database, and storage. Best of all, ExtraHop gathers all of this information passively by analyzing the wire data passing over the network in real time—no agents or synthetic transactions required! Many of our thought-leading users are also pairing this real-time wire data with logs and other machine data that is stored and indexed in Big Data solutions such as Splunk. The combination of wire data and machine data provides a flexible and comprehensive way to monitor your entire Citrix environment. One of our most enthusiastic users of this joint solution is John Smith, Citrix Technology Professional and a Citrix Architect at a leading healthcare managed-services provider. 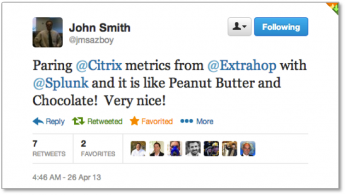 He compares the fit between ExtraHop and Splunk to peanut butter and chocolate. We're not sure about being peanut butter, but you get the idea. :-) Read John's analysis of why ExtraHop works better than agent-based solutions when monitoring Citrix environments. Stop by booth #409 at Citrix Synergy to get an in-person demo of our solution. In addition, make sure to attend the Geek Speak Live! panel discussion moderated by Brandon Shell on Wednesday from 2:30 pm - 3:15 pm in Room 210B. In that session, ExtraHop CEO Jesse Rothstein will join solution architects from Splunk and Citrix to talk about monitoring desktop virtualization environments. The session title says it all: "Data everywhere and still no visibility: How to consolidate your Citrix data for greater insights." If you'll be at Citrix Synergy, it's a session you don't want to miss!